In previous post, we saw how to configure coherence adapter. You must have noticed that we used default cache name “adapter-cache” and wondering from where we got that name. In this post we see how to get cache name. I recommend you to read previous post before to start with this post. We have three default JNDI’s for coherence adapter. As you noticed, when we configured the coherence adapter we used the first default JNDI. We can also use custom coherence JNDI, click here to see how to create and use custom coherence JNDI. Now to check the cache name, click on the JNDI which we used. To go to that JNDI, first open admin console; go to Deployments à CoherenceAdapter à Configuration à Outbound Connection Pool. Click on the first JNDI. You see one cache config file location there. Go to that location and open that file. You see cache name is mentioned there. 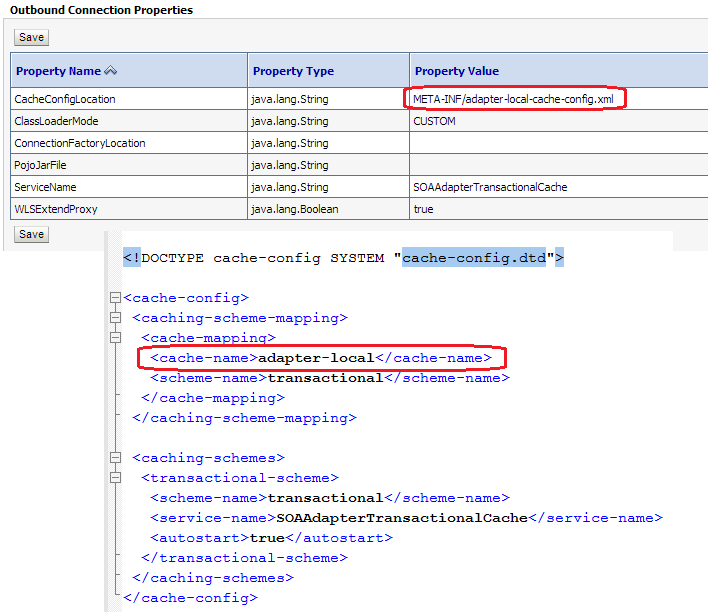 So if we need to use first default JNDI then need to use adapter-local as cache name.